Parking: National Park Centre car park in Hawes (grid reference SD 876 898). The walk begins in the car park by the Tourist Information Centre. Leave the car park by the slope between the wooden railings near to the public toilets in the corner of the car park. At the top of the slope turn right onto the Hardraw Road. The road goes over the bridge with the steam engine sat on the rails to the right of the road. After about twenty yards take the road to the left signposted Industrial Estate, and then almost immediately turn right over the stile signposted Pennine Way. Follow the flagged path alongside a fence and through a kissing gate onto the road, keeping the large mast to the left. Straight ahead is a bridge over which can be seen Abbotside Common and Great Shunner Fell. Turn left onto the road, over the bridge and head straight on ignoring the sign indicating Hardraw to the left. The road heads between two sets of trees and starts to climb. Immediately on passing the trees, climb the five steep steps on the left leading up to a stile / gate in the wall, go through the gate and then continue straight ahead keeping close to the wall, following the sign for Hardraw / Pennine Way. Go through the narrow gap to the left of the next gate and keep straight ahead to another narrow gap in the wall and again continue straight ahead. There is an excellent view back towards Hawes and to the hills around. Pass through another hole in the wall and again keep straight ahead. From here keep to the narrow stoned flagged path that leads through several more fields. Please walk in single file so as not to trample the grass, as these fields are grown and cut to use for animal feed. On passing through the kissing gate, the flagged path bends to the left of the next wall and meets a track coming in from the left. Continue for another twenty yards through a narrow gate in the wall and out onto the road. Ahead is the Green Dragon public house. Enter the Green Dragon and pay a small fee to pass through and out the back. 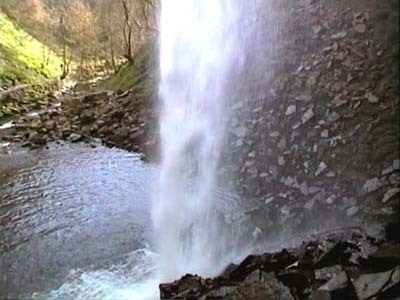 The fee helps with the upkeep of the path up to the waterfall, as it is all on private land. From the back of the public house continue straight ahead through the car park and down the left-hand side of the three garages. Continue on the path entering a narrow wooded gorge, where after another couple of hundred yards the waterfall comes into full view. Here water drops 96 feet making it England's highest above ground waterfall, and with the gorge around it, makes a natural amphitheatre, where brass bands can sometimes be heard to play. It was once possible to walk all the way behind the falls, but this is no longer allowed on safety grounds. Return back through the Green Dragon and turn left back onto the road. Immediately turn left again at the side of the Green Dragon and follow footpath sign for Simonstone through two narrow gates about ten yards apart. Follow the flagged path up the field with the wall on the left. Go over the wooden stile and continue up the field towards the farmhouse. Behind now there is an excellent panoramic view of the Wensleydale Valley and back to Hardraw. Continue heading for the red gate to the left of the farmhouse. Go between the farmhouse on the right and a barn on the left, and continue on the flagged path across the field. The flagged path is signposted Simonstone and Sedbusk on the end of the building. Head across the field to a narrow gate in the wall just to the right of a farm building. Follow the path along the right-hand side of the wall, and through a narrow gate in the wall to come out on a road opposite the Simonstone Hall Hotel. Behind on the opposite side of the valley all the parallel dry stone walled fields can be seen, which are indicative of this area. Turn right along the road and continue until the T-junction. Turn left at the T-junction and after about twenty yards take turn right through narrow gap in the wall following the footpath sign to "Sedbusk ½ mile". Follow the farm lane through the gate and continue along the lane heading for the left-hand side of the farm. Go over the stile level with the middle of the second building and continue along the track for another thirty yards before climbing the next stile. Continue now in almost a straight line crossing a succession of small walled level fields using narrow gates and stiles heading for the houses of Sedbusk. The footpath is marked in places with yellow waymarked arrows. As the houses are approached keep straight ahead and the path cuts between two houses and out heading for the red telephone box on the road. Turn right and follow the road down out of the village. The road passes a red post-box in the wall in the next to the last house of the village, and then passes Paddock Cottage. The road starts to go downhill from where the Cams Houses footpath sign goes off down a lane to the left, ignore this and continue down the lane. Twenty yards further down the road, go through a narrow gap in the wall on the right next to a telegraph post sign-posted Haylands Bridge. The footpath keeps reasonably close to the right-hand wall heading towards another narrow gap in the wall. Continue in the same direction across the next field heading for a narrow gap in the far corner of the field about forty yards to the right of an actual gate in the wall. Through the gap and down six steps onto the road, veer slightly to the right and go through narrow gap in the wall following sign for "Haylands Bridge ½ mile". The path now heads diagonally across the field heading for the bridge over the River Ure. Before reaching the road, an old packhorse bridge is crossed. Once on the road turn left and go back over the bridge and retrace the first part of the walk for the final six hundred yards back to the car park in Hawes.